Eastern Bluebirds are a welcome addition to many birdwatcher's backyards in New Hanover County and throughout the eastern United States. Eastern Bluebirds can be found year-round in our area. Eastern bluebirds can be identified by their bright blue back, head and tail, the orange/brown breast, and white belly. There are some other blue colored birds that you may see in our area (indigo buntings, blue grosbeaks, and blue jays for example), but the eastern bluebird is the only one with the characteristic orange/brown breast and white belly. Male Eastern Bluebirds tend to be more brilliantly colored than the females. The blue back on a female may look more gray or brown, and the orange patches on her breast are lighter. Eastern Bluebirds are cavity nesters- meaning that in the wild, they make their nests in the cavities of trees. They are also one of the most common birds to use nest boxes, and many bird houses now are built specifically for these birds. 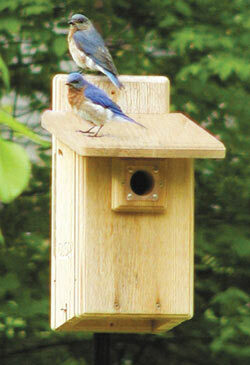 We also sell a wide variety of bluebird houses and accessories! Click here to check them out! Eastern Bluebirds eat insects and seeds. At Wild Bird & Garden, we stock mealworms and sunflower hearts- some of the Bluebirds' favorites! If you are interested in the Eastern Bluebird, please check out the North Carolina Bluebird Society's webpage: http://www.ncbluebird.com/ It contains valuable information on this species, and becoming a member is free! The more colorful male Eastern Bluebird on the left, and more drab female on the right. 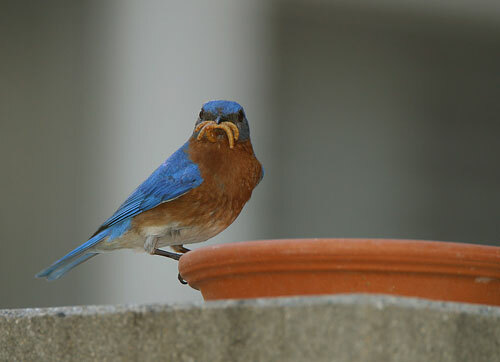 Male Eastern Bluebird eating mealworms. Male (lower) and female (higher) Eastern Bluebirds sit on a nest box.